Sunset Farm Cabins originally opened in the late 1980's. The name and idea were derived from a famous local story of the original Sunset Farms located just a short distance up the road from our current location dating back to the 1930's. It is very difficult to find the exact details and dates from the start to closure of the original Sunset Farms but we have compiled what we read and heard locally. The greatest asset of the knowledge we have comes from the original Sunset Farms Cookbook which offers delectable dishes from the original owners Rubye and Ed Bumgarner. According to Rubye the Great Depression or a few chickens caused the product of Sunset Farms. Rubye's husband Ed decided back in this time period to raise spring fryers for the market. According to Rubye he spent countless hours day and night taking after their well-being and they spent every penny they had buying feed. When the time came to sell the chicken buyer offered 19 cents per pound which was far less than they had already spent on just the feed, not to mention the hours involved. If it hadn't been for the fact that Rubye was then teaching and received a paycheck in the amount of $75 per month they would have been in big trouble trying to feed the chickens and themselves. Ed found another buyer to visit the farm after turning the first away and to his astonishment the second offered only 9 cents. Let's just say Ed had enough and told Rubye he was just going to feed the chickens to his hunting dogs. What Rubye did next was convince Ed to let them sell chicken dinners to visitors traveling through. Rubye mentions that Ed was very wary of this idea but she was able to our-talk him. Without any money for advertising Ed found a painted white board and used black shoe polish to make the "Chicken Dinner" sign. This was truly the start of Sunset Farms! Visitors started trickling in purchasing the chicken dinners and they would then tell their friends. Since no other places existed to eat it became pretty popular. Some of the tourists mentioned they would like to stay at the farm for a few days and this launched the Inn. Rubye writes that they dressed up their two bedrooms as they themselves slept on a pallet in the attic and the Innkeeper career began. Not too long after this they were even able to afford a professional painter for the highway sign which became a place of honor among their souvenirs. This story really opens our eyes to the history behind the original Sunset Farms and we hope to carry on the history through our service and having a copy of the cookbook in each cabin for our guest's to enjoy. We are not sure how many years Sunset Farms was opened for but hope to meet somebody locally that can share additional stories and information for this page. 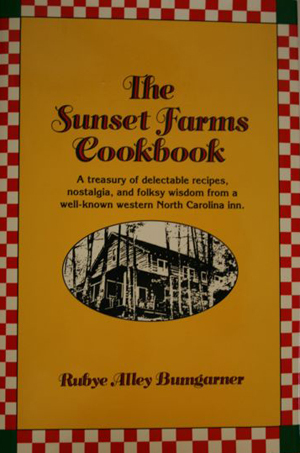 This information was derived from the original Sunset Farms Cookbook written and published by Ruby Alley Bumgarner from Sylva, NC in 1980. You can purchase a copy in our office at Sunset Farm Cabins.